Veeam Backup & Replication integrates with Veeam Explorer for Microsoft SharePoint. 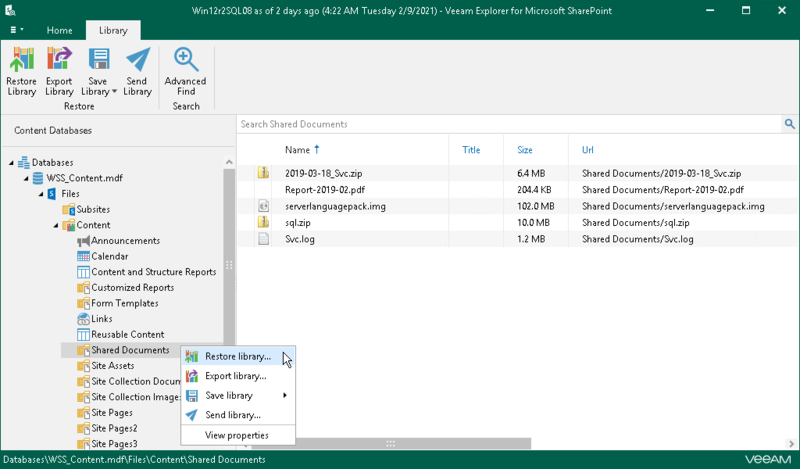 Veeam Explorer for Microsoft SharePoint lets you browse Microsoft SharePoint content databases in VMs located on storage snapshots and restore documents, items and document libraries that you need. Before you start working with Veeam Explorer for Microsoft SharePoint, you need to extract a Microsoft SharePoint content database (an MDF file) from the storage snapshot. To do this, you need to restore VM guest OS files from a backup of the virtualized Microsoft SharePoint server, manually locate the content database and open it in Veeam Explorer for Microsoft SharePoint. Restore VM guest OS files from a backup of a virtualized Microsoft SharePoint server. For more information, see Restoring VM Guest OS Files (Microsoft Windows). In the Veeam Backup browser, locate the MDF file and double-click it or select the file and click Application Items > Microsoft SharePoint on the ribbon. Veeam Backup & Replication will attach the content database to the Microsoft SQL Server on which the Veeam Backup & Replication configuration database is deployed and open the database in Veeam Explorer for Microsoft SharePoint. After that, you can browse the database and restore items that you need. From the main menu of Veeam Explorer for Microsoft SharePoint, select Help > Online Help.